Cool Stuff: Original Comic Art! Well, I could've sworn I had a fair amount of Daredevil pages in this folder of scans... but oh well! 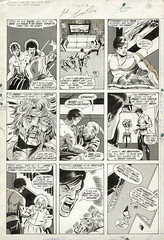 Here's page 19 of Deadly Hands of Kung Fu 19, by George Perez! This would be from a Sons of the Tiger story.